Botox is awesome for reducing wrinkles around and between the eyes! crow's feet and lines between your eyes (glabella area) Can Be Reduced Or Eliminated With Botox. Botox is the perfect cosmetic treatment to improve the appearance of facial wrinkles and lines in the forehead, crow's feet and beyond. It relaxes the muscles that create common signs of aging and stress. Botox, and it's common competitors, Dysport and Xeomin, are typically the foundation of medically based anti-aging strategy. BOTOX® Cosmetic is quick treatment that can take as little as fifteen minutes but can provide robust improvements in your appearance. BOTOX® Cosmetic has been used for many years and has proven safe and effective. Treatments generally last three months. Maintaining a regular schedule of treatments are recommended at three month intervals. Spa 35 has been providing our clients with Botox and other non-surgical cosmetic services since 2006, so you can trust your provider has the expertise to provide you with the most effective and safe treatment possible. *Results vary by Individual ** Dr. Parsa joins The Doctors to demonstrate botox injections in preparation for the Oscars event. What is BOTOX® Cosmetic helpful in treating? Results vary. Botox works on most muscles, cosmetic uses include between the eyes, around the eyes and forehead. Before and after photographs show the reduction in wrinkles between the eyes with a BOTOX® Cosmetic injection and it's lasting impact over a four month period. Results vary by person. Please discuss how you might benefit from Botox with a Spa 35 injection provider. Botox® Cosmetic is manufactured and distributed by Allergan®, whose other products include Juvederm and CoolSculpting. Botox, and other neuro-regulators like Dysport and Xeomin, are sold by the injected unit. The number of units you need varies greatly based upon your unique physiology, desired results and frequency of treatments. In general, younger people need less Botox than older people and men require more Botox than women. You can usually expect to pay between $200 and $400 for each treatment. Men should expect to pay at least 50% more, as their muscles usually require more. Medical Staff - The team is led by Nurse Practitioners and composed of Registered Nurses and aesthetic skin care professionals. Botox and filler injections are performed by medically trained injectors, not estheticians. Photographs on this website are used to illustrate how services are used and their potential impact on your appearance. Your results will not completely match any photographs. Genetics, sun exposure, diet and exercise all influence your results. The Spa 35 Med Spa team strongly encourages all of our clients to maximize their lifestyle choices. BOTOX® Cosmetic is one of the safest and most predictable aesthetic procedures you can have done. It works quickly, can have dramatic effects and lasts about three months. During your consultation the Spa 35 staff will review contraindications, such as ALS or other neuromuscular diseases that prevent you from being a candidate for BOTOX® Cosmetic. Bruising can occur at the injection site. 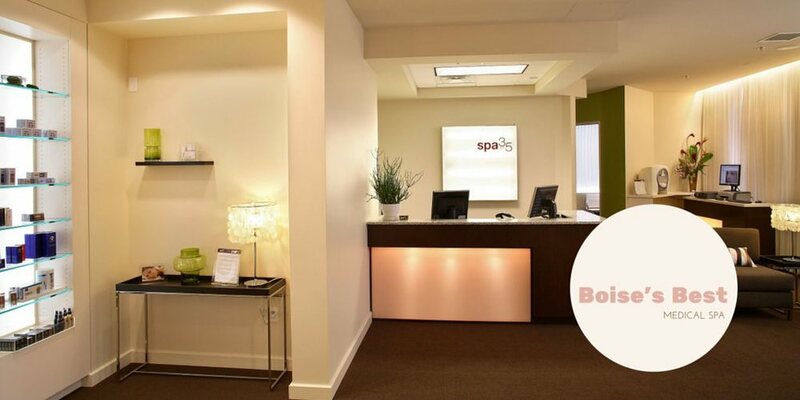 Be sure to check out the other Spa 35 aesthetic procedures and products while you're here. Many patients request information on CoolSculpting fat removal and Intense Pulsed Light skin rejuvenation while they're getting their Botox. As we age the repetitive contraction of muscles around the eyes, between the eyes and in the forehead create wrinkles and folds in the skin that are not present when we're younger. The combination of this constant folding of the skin with other environmental damage, such as sun damage and free radical damage (e.g. smoking) results in crow's feet, smokers lips and other cosmetic concerns. BOTOX® Cosmetic interrupts the chemical communication between the nerves and the muscles in the treatment site. Your body adjusts to this change in about three months and the muscle once again contracts. Allergan, the manufacturer of Botox has a more complete explanation of how Botox works and it's safety record. This link will take you to the Allergan Botox site. Your eyes are one of the first areas to show the signs of aging. Most times it is the first place someone looks when we meet them. There is constant muscle movement in the area, the skin can be thin and the area can be constantly exposed to the sun. To return your eyes to their more youthful appearance you may want to consider adding light based procedures to your BOTOX® Cosmetic injection. Such as Laser Skin Resurfacing, Intense Pulsed Light or Skin Tightening. These procedures can help restore the skin collagen and elastin that has been lost in the skin around the eyes. And, don't forget about the impact you can have on the skin, particularly around the eyes, with the use of the proper skin care products. Foundational products of every skin care regime include a Vitamin A based product (e.g. Retin-A), Vitamin C, cleanser (preferably with a low pH) and a physical sun block (used everyday, preferably applied twice a day). Extensive research has been conducted on the safety and efficacy of BOTOX® Cosmetic. The Allergan website is a great resource for detailed information, you can reach it with this link. How long will BOTOX® Cosmetic last? BOTOX® Cosmetic last about three months. Spa 35 highly recommends you stay on a regular schedule of injections every three months. By staying on a consistent schedule the muscles you're relaxing with your Botox injections will become smaller over time (atrophy) and help you achieve your cosmetic goals. How much does BOTOX® Cosmetic costs? BOTOX® Cosmetic is sold by the injected unit, typically in the range of $10-$13 a unit. Each treatment area, each patient and each procedure are unique. New patients receive a consultation and the Spa 35 skin specialist can provide an estimate based upon your goals on desired treatment areas. Men usually have stronger, more developed muscles and can expect to need 50-100% more BOTOX® Cosmetic than a female. Generally you can budget between $250 and $450 for your first treatment. On subsequent procedures you can use the efficacy of the first treatment to judge if you'd like to increase or decrease the amount of BOTOX® Cosmetic you receive. What are the risks associated with BOTOX® Cosmetic injections? Extensive research has been conducted on the safety and efficacy of BOTOX® Cosmetic. The most common side effect of BOTOX® Cosmetic for Spa 35 patients in a dropping of the upper eye lid, the other most common side effect is bruising of the injection site. What are other uses for BOTOX® Cosmetic injections besides Crow's Feet? BOTOX® Cosmetic has a number of uses many people are unaware of. Such as reduction of migraine headaches, excessive sweating (e.g. underarms and palms), and pain management. Speak to the Spa 35 medical providers for additional information on these other uses. Who are the qualifications of the people injecting Botox at Spa 35 Med Spa? Nurse Practitioners and Registered Nurses inject Botox®, Dysport®, Juvederm® and other cosmetic fillers at Spa 35®. We do not have estheticians or dental hygienists injectors at Spa 35®. severe crow’s feet lines and frown lines between the eyebrows in adults. you become dizzy or faint. Xeomin® (incobotulinumtoxinA); have a skin infection at the planned injection site. Please see additional Important Safety Information on following page. difficulty breathing from typical doses of BOTOX® Cosmetic. BOTOX® Cosmetic passes into breast milk). Tell your doctor about all the medicines you take, including prescription and nonprescription medicines, vitamins, and herbal products. told your doctor that you have received BOTOX® Cosmetic in the past. eye problems: double vision, blurred vision, decreased eyesight, drooping eyelids, swelling of your eyelids, and dry eyes.